We gave DraftKings.com 5 stars, because they are simply the best in the daily fantasy sports industry right now and for good reason. With huge money contests, a large player base and huge venture capital investments putting money into the industry behind DraftKings, fantasy players can feel secure knowing that Draft Kings will be around for as long as there are players playing fantasy sports. We love the HUGE cash prizes and are ecstatic that you can even qualify for these games playing for free or from just $0.25 to a few dollars. In fact, when you join DraftKings using our links, you get a free ticket to qualify for one of these big cash tournaments when making your first deposit. If are looking for good competition and a ton of fantasy games to play, you need to sign up and become a player at DraftKings. Customer Support not 24/7. No phone support. Salary Cap Games - Choose a team of players and fill a roster using a salary cap of $50,000. You can create Head to Head, 3 Man, 5 Man, or 10 Man matches or join larger games offered up by DraftKings. 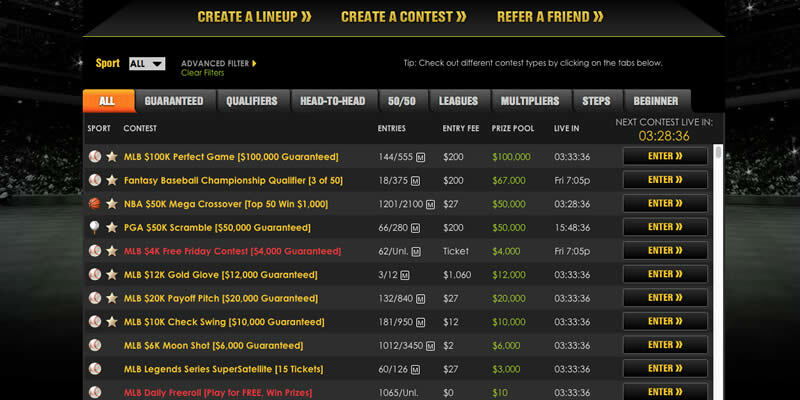 DraftKings Step Tournaments – Are you really good at fantasy sports but are lacking funds? You can enter for free or for as little as $2 into a DraftKings Step Tournament, and if you keep winning, you will get a seat at one of the big cash tournaments or win a nice chunk of change. Current DraftKings promos are featured prominently on the main Lobby page. Below are all the fantasy games listed that are available to join. There is a tab that allows a player to narrow down games by sport and there is also an advanced filter tab that narrows games into further categories. There are a lot of games given the large player base at Draft Kings so using the tabs is a necessity. If you scroll down the list of games, there are games highlighted in Yellow, Red and White. Yellow are DraftKings.com sponsored contests, Red ones are DraftKings sponsored freeroll games and the white ones are games created by other fantasy players offering up a challenge. At the top of the DraftKings.com main page you will find your current balance as well as the deposit button in case you need to re-load at some point. Once you have chosen a game, we like that you can attempt to create a team without committing to it and paying first like some sites do. This way, if after you have done up a team and you aren’t happy with its prospects, you can simply leave the page and not participate in the game at no cost. On the other hand, if you really love your team, there is an option to use the same team instantly in other games just by selecting the games and clicking a button. When filling out a lineup, you will find a nice amount of info on the “player card” that you can see if you click a player’s name, allowing you to further gather info before making a final selection. 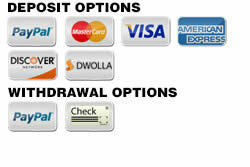 Deposits can be made easily through PayPal, Amex, Visa, MasterCard or Discover. Dwolla is also a new option increasing in popularity. You can make a minimum deposit of $5 and a maximum of $2000 although that can be increased in certain circumstances by contacting support@draftkings.com. Upon deposit you will receive a FREE contest entry w/ 1st deposit if you use any of our DraftKings links or right now by clicking here to go directly to DraftKings.com. Players joining through Real Money Fantasy Leagues do not require a promo code. We have negotiated to offer the free contest when joining through any of our links. You need a minimum of $1 in your account to withdraw and cashouts are made through PayPal or Check. Payments are processed within two business days, but usually happen much faster. You can email DraftKings at support@draftkings.com, open a ticket under the Customer Support tab, use snail mail via the postal service (does anyone still use this?) or there is a Live Chat window that pops up under the Customer Support tab. Before posting our DraftKings review, we tested out their customer support, and found that answers to questions can be made in a timely manner (provided it’s not the middle of the night). Customer Support business hours are 6am-11:59pm EST every day including weekends. For such a large site, we are surprised they don't have phone support via a 1-(800) number that is 24/7. DraftKings.com mobile platform allows you the ability to do everything the full DraftKings.com site does. 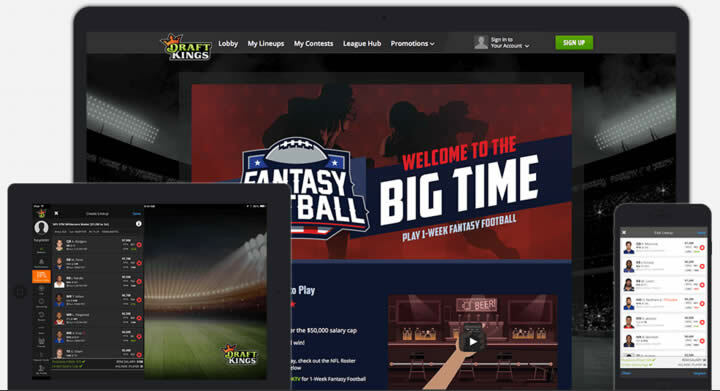 It is easy to navigate on your favorite mobile device - iPad Air, iPad, iPhone and most Android devices are supported and all the features that fantasy players need to sign up, deposit, choose games and play at Draft Kings are offered. 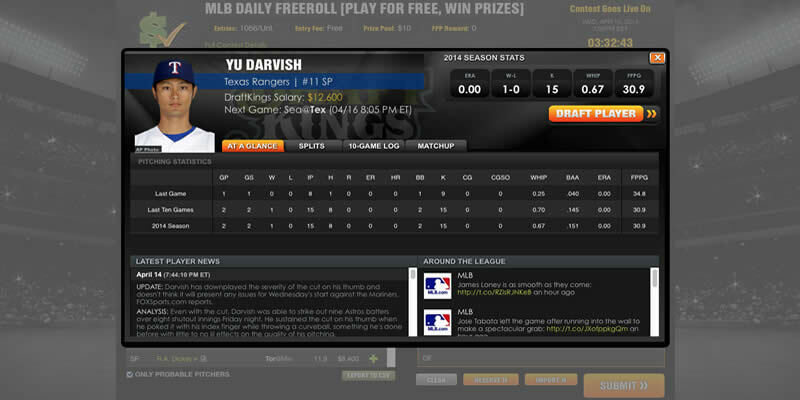 Choice is the name of the game at DraftKings with tons of fantasy games available. We are a bit disappointed that a fantasy site that does so well to build a fan base has not expanded their repertoire of games from just Salary Cap style games. However, they make up for it by offering some of the biggest fantasy cash prizes in the industry with millions upon millions given out for the major sports. Once you choose a game to play, their salary cap numbers are tough but fair - you will definitely have to do some research to create a top fantasy lineup. We found no issues navigating through games and had no software glitches to slow us down. Once you’ve created a lineup, you can choose to export that lineup immediately, or if you decide later to enter a contest, you can choose to import an older lineup into your current game. Once the games begin, their live scoring updates are almost instantaneous and let you follow the action right on your screen.